LYLAS gives a rousing debut performance to a packed house! Asheville's only all-female sketch comedy troupe, LYLAS is a collaboration between Jenny Bunn, Beth Keefauver, Emily McClain, Emily Miller and Betsy Puckett. Their debut performance of "WASH-TV" has become Asheville's newest and most hilarious theatrical sensation. Selling out four shows and turning people away at the door, LYLAS promises a re-run of the show in December. 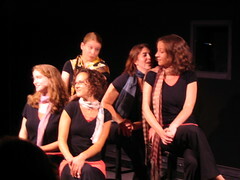 ASHEVILLE -- LYLAS, Asheville's first all-female sketch comedy troupe opens its first show Friday for four performances at 35below, the black box theater downstairs at Asheville Community Theatre. LYLAS (an acronym which stands for "Love Ya Like A Sis," commonly scrawled in yearbooks and across the bottom of notes passed between girls), is a collaboration between Jenny Bunn, Beth Keefauver, Emily McClain, Emily Miller and Betsy Puckett. Described as "the Rebelles -- but fatter and clothed" or "Menage -- without the musical talent," LYLAS has an Asheville take on sketch comedy. LYLAS performances run at 7 and 9 p.m. Friday and Saturday night at 35below beneath Asheville Community Theatre, 35 E. Walnut Street, downtown Asheville.